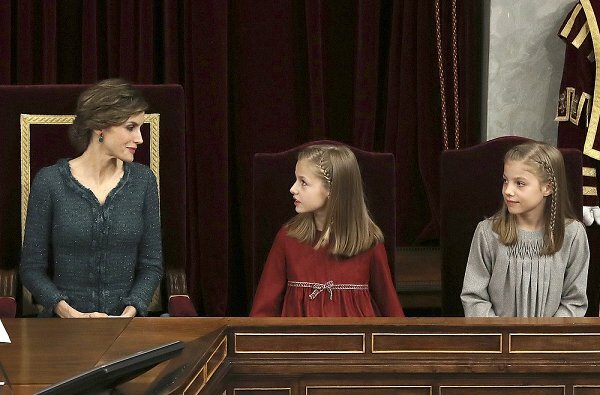 On 17 November 2016, King Felipe, Queen Letizia, Princess Leonor and Princess Sofia attend opening ceremony of the term of office held at the Lower House in Madrid, Spain. 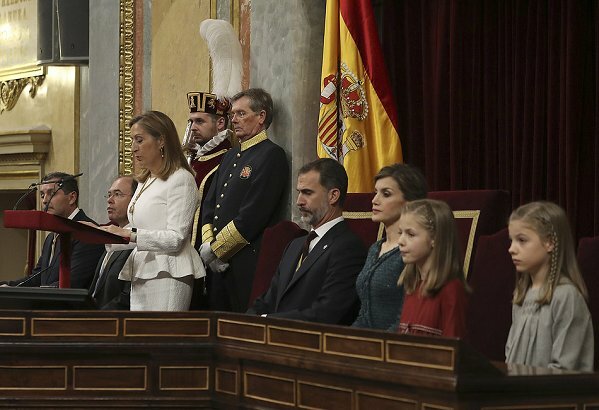 Spain's Prime Minister Mariano Rajoy will begin a second term in office, this time with a minority government after a parliamentary vote ended a 10-month political deadlock following two inconclusive elections. Queen Letizia's coat is very pretty, and it seems to fit her like a glove! I wish the fabric was the same on the back; that seems a little bit odd. Yes , the dress would look much better in one fabric. Girls are nicely dressed as always. Oueen Letizia looks so beautifully delicate. Letizia is a beauty and both girls a very pretty. Especially the red dress is becoming. 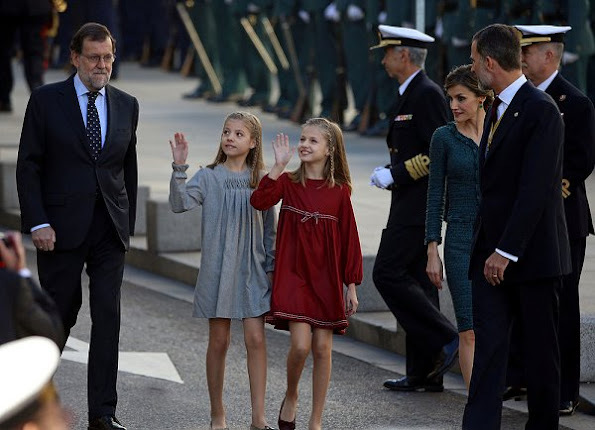 But I never know which of the girls is Leonor and which Sofia. Leonor is in red. Typically as on the pictures she will walk after her Mother as she is the heir. Leonor has sharper features facially than Sofia. That may help you as well. Thank you for the useful hints, Diane! Your welcome Coralie. They are very similar. Cute girls. Letizia´s dress is lovely at front, wish like others it would be same fabrick both sides. Also her up-doe is very nice. Sofia will become tall woman. 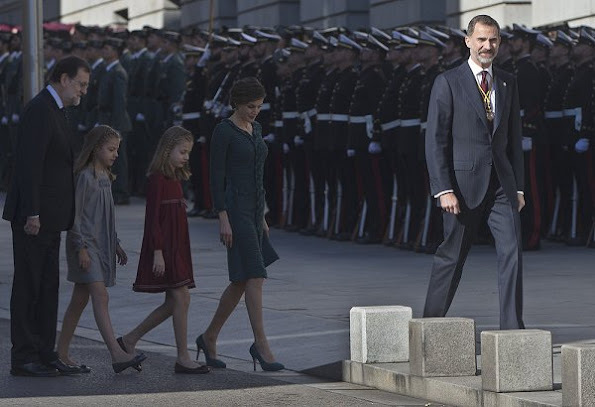 La familia real de España es un placer para la vista. Letizia estaba bellísima y sus hijas son tan bonitas como bien educadas. Han saludado junto a sus padres a unas 600 personas sin perder la sonrisa ni un momento. Son unas princesitas perfectas. Not sure why Letizia's dress is two colors. I love the front color. She is elegant as always. Girls are so cute. No son dos colores, Diane, sino dos texturas diferentes de tweed. @ Angie the dress is not in two different textures of tweed. The back of the dress is different kind of fabric. I like the front of the dress, not the back. PS.See photos in Daily Mail. OMG! Look at the Queen's hand in the fourth photo when the daughters are waiving. It's just the scelet!! I don't see anything wrong with her hands. She is slim so the size of her hands are according to her figure. She can't have big hands, then it would look not normal. Wow sofia is taller than her sister already. Yes, it would be better if it is made with one fabric only. As most of the time, Queen Letizia looked amazing and the girls have grown up so fast especially Sofia! She must inherit her father's height. Both girls are lovely in their dresses. 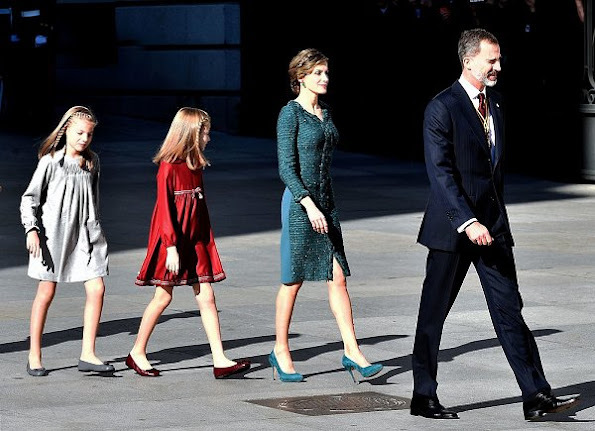 Letizia´s dress is great and fits her. But that´s no reason to wear it on and on. It become boring.